monks in the Tibetan Buddhist tradition. There are many uses for mala beads. to remind them to stay present and keep breathing throughout the day. lifestyle as well as a spiritual piece of jewelry. aid in aligning the chakras and centering the auric field. 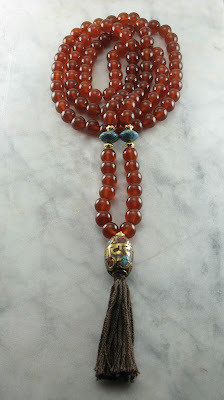 guru for a mala designed especially for your practice. If you have any questions about purchasing a mala please contact the author. A big thanks to Jacqueline Medalye for her very informative article. will be hearing more from her in the future! Hey,Thank you so much for sharing your knowledge with me. I appreciate it very much. I love expanding my knowledge about these beautiful and culturally rich practices and I appreciate when people such as yourself are generous enough to share what they know.Thanks to all!!! In our daily lives, meditation can be very helpful in eliminating many physical and psychological problems. A significant amount of the disease we experience is actually either directly or indirectly the result of conflicts, repression, or emotional distress arising in the conscious or unconscious mind. Meditation helps us to become aware of these conflicts and to resolve them, establishing tranquility and peace. In this way, meditation becomes a powerful resource for facing the challenges of daily life.